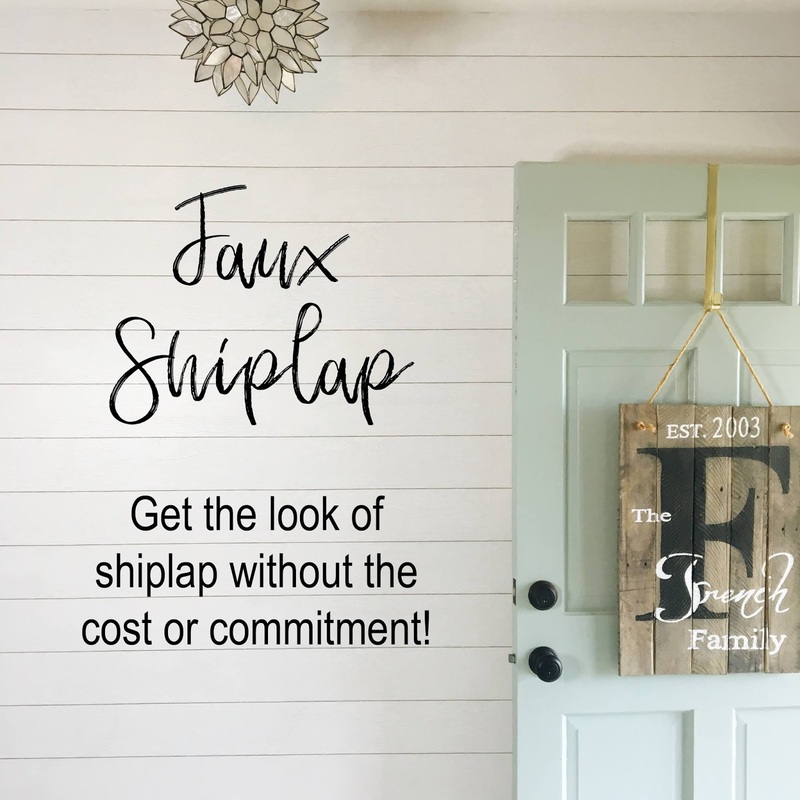 Midwestern Mama: DIY: Faux Shiplap + a Video! Hey friends! I have been talking about changing out my blue accent wall for a while now, and I finally did it! If you have been following me for more than 5 minutes, you know I love anything blue. 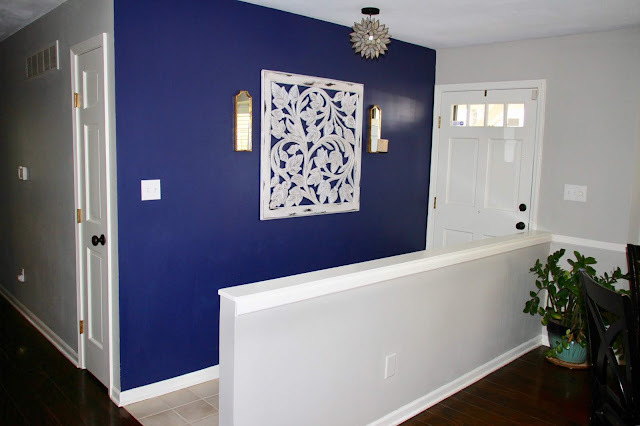 Our entire house is grey (Sherwin Williams Mindful Grey to be exact), so when we moved in, I wanted a little bit of color and decided to paint this wall and our 1/2 bathroom a bright blue. I loved it so much, but it was pretty dark, especially in a house that is already dark. After we had the beams removed on our ceiling, the blue paint got a little bit messed up towards the ceiling, so this motivated me to proceed with something new and different. I was really torn about what to do. When we purchased this house, the wall that is now just a half wall used to go all the way to the ceiling. 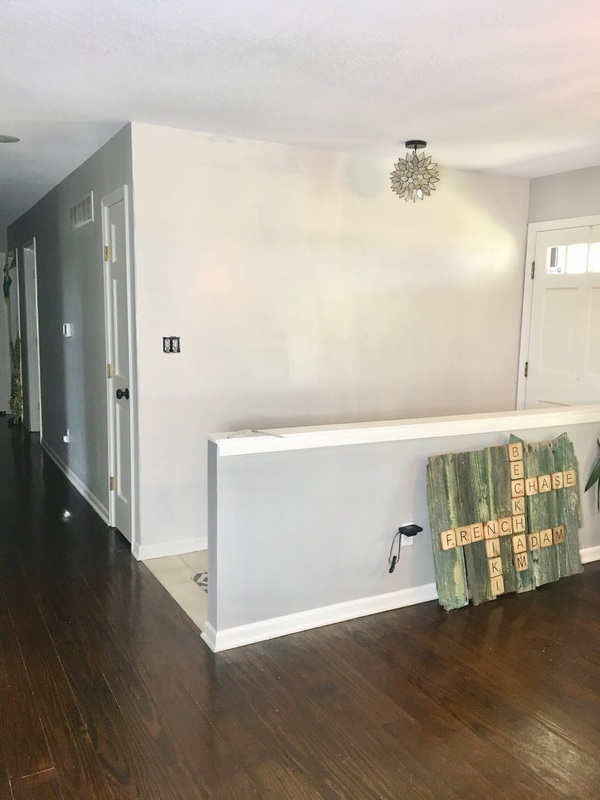 Ideally, we would have removed the entire wall, but since there was tile flooring that extended the entire length of the wall, we felt it would look really strange to remove the wall and leave the tile. Removing the wall would mean we would need to match the existing hardwood floors, which are original to the house. That also means we would have had to refinish the entire floor. Our house is a ranch, and 80% of it is hardwood, so that's a lot of flooring! It would have been a very big challenge and an even bigger expense. Neither of which we were ready to tackle when we moved....or even now for that matter. I don't love the half wall, but I do appreciate how taking it down to the current height definitely opened the room up. I have fun plans for the existing tile flooring, so hopefully I can start working on that project soon! Back to the wall. I thought about Stikwood. If you haven't heard of that before, you should check it out! It's so cool, but would have been pretty pricey to cover my entire wall. And then I thought about picking a crazy wallpaper pattern. But, I couldn't find anything I was just in love with. I thought about shiplap, but I didn't want to commit to putting up real shiplap incase I didn't like it. 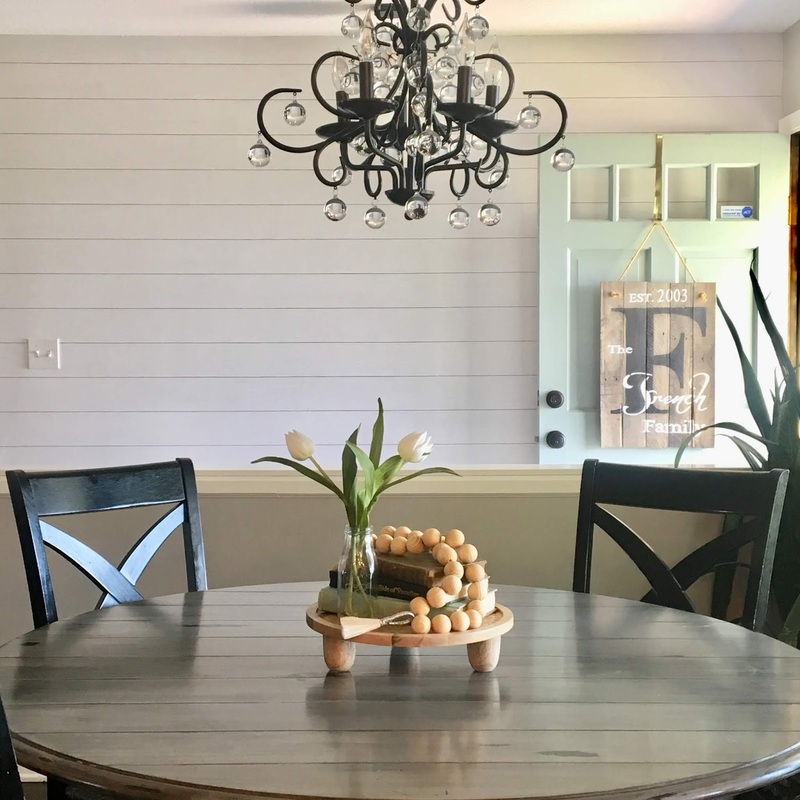 I love shiplap in other people's homes, but I wasn't sure it was the right fit for this space. I had heard about all of the new peel and stick wallpapers available nowadays, and I was intrigued. After looking at several different options, I stumbled upon good ole Target! They had so many different peel and stick wallpaper designs! And, they were all very inexpensive. I loved the idea of being able to do this project with no previous wallpaper experience, unless you count covering the inside of my high school locker with contact paper. And actually, that's exactly what this stuff reminded me of. Fancy contact paper! 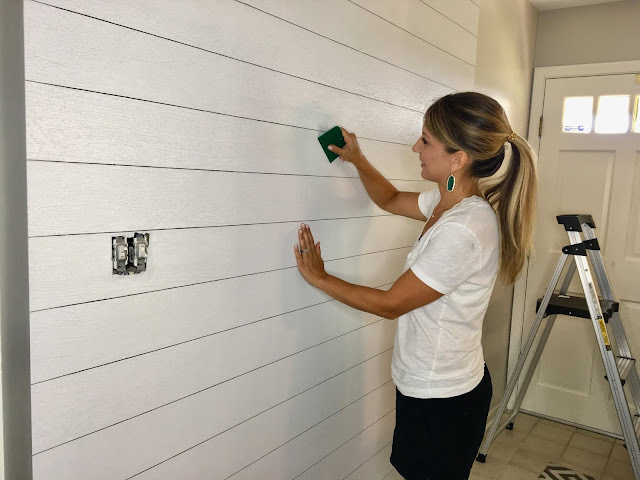 I also loved the idea of getting to try something, like shiplap, without a big commitment. Before I even began with the wallpaper, I decided to paint my wall a lighter color. Since the wallpaper I chose was white, I was concerned the dark blue would show through. I got a very inexpensive can of paint from the Habitat ReStore in a random shade of white. It is recommended to use eggshell or semigloss paint under the wallpaper to help it stick. I enlisted the help of my friend, Nan, because I thought four hands would be better than two. I was definitely glad to have help in the beginning, but I ended up hanging the last two pieces on my own, and it was fine. So, if you can get someone to help you, I'd recommend it, but if you are flying solo, you should be fine. 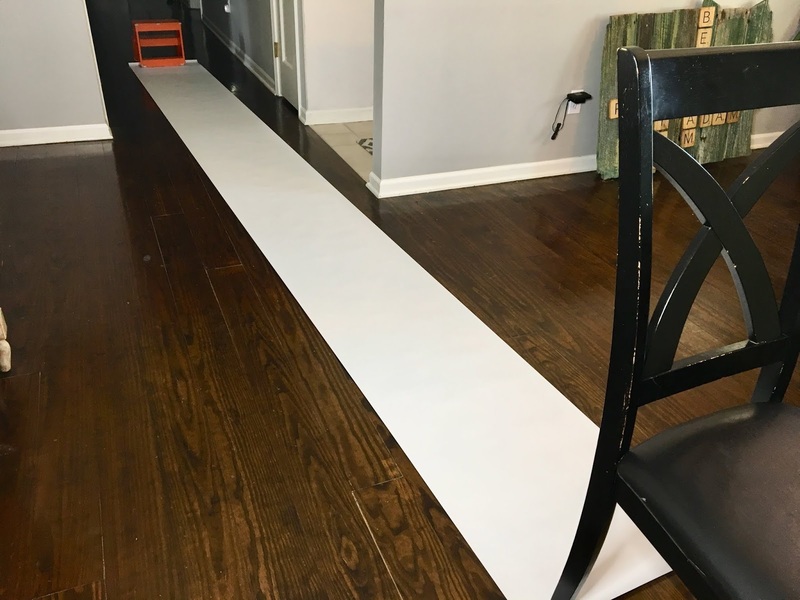 You will want to unroll the wallpaper and let it sit for several minutes to help it straighten out. This will just make it easier to manage when you're hanging it. Measure the length you need and mark it. Allow several inches at both the top and bottom, and when making subsequent cuts, ensure your patterns will line up. You will probably have more waste on the 2nd, 3rd, 4th, etc pieces than the first because you will need to match the pattern with the piece that is already on the wall. Starting at the ceiling, you will want to peel away about 12-18" of the paper backing from the wallpaper. Working with just 1-2 feet at a time will make it easier to manage and move around, should you need to reposition it. 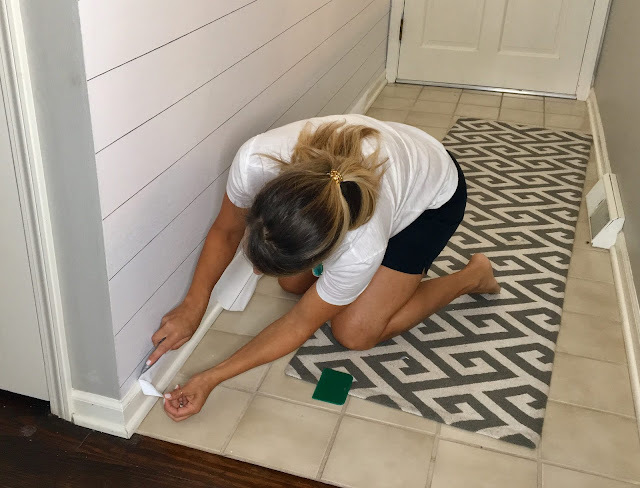 Once the wallpaper is lined up where you want it, use a soft, plastic scraping device to smooth out the bubbles and secure the wallpaper to the wall. We happened to have a plastic piece from a previous project. I was surprised the wallpaper did not come with this tool, but mine did not. I have heard of people using shower squeegees if your wallpaper doesn't come with a smoothing tool. 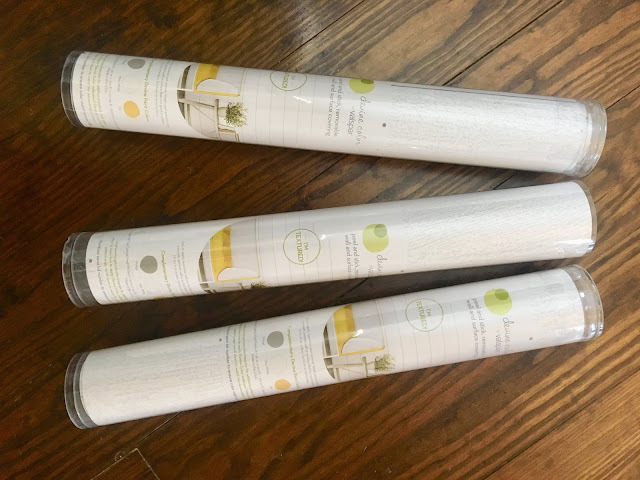 If you need to reposition the wallpaper, you can gently and slowly pull it back away from the wall to the point where you can get it lined up correctly. Avoid pulling to quickly or you may tear the wallpaper or the wall. Once the wallpaper was up, I carefully cut along the edges with a utility knife and pulled the excess away. I used the scraping tool once more to secure the edges extra good. And, that was it! All in all, hanging the wallpaper took me about 3 hours and the total cost was under $100. I don't know of many other projects that can make a statement like this for so little time and money! So, how does it look you ask? Well, I am very please with the final result! The wallpaper is actually a little bit textured, so I love that part of it. I will say it's not perfect, and if you get close you can definitely see some bubbles and seams (like in the pic above). But, from as little as a few feet away, you honestly can't tell it's wallpaper! Everyone who comes to our house has been amazed when I tell them it's not real shiplap! If you like the shiplap trend, but don't want to commit to the real deal, I highly recommend going the removable wallpaper route! 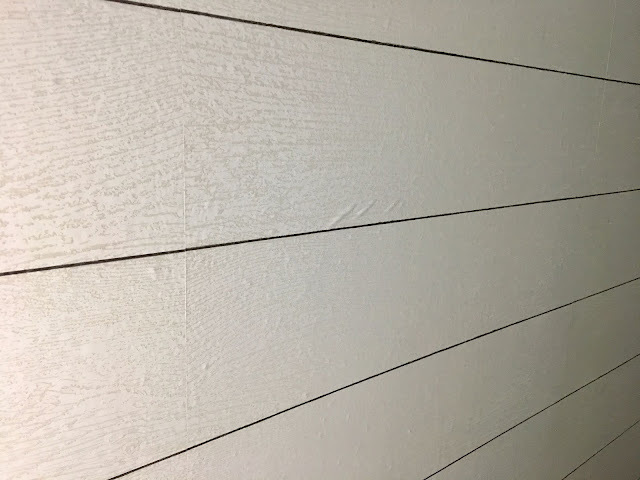 And if shiplap isn't your thing, they have TONS of different styles available. Just search on Pinterest and you will be amazed. Now, the big question is...can it be removed without damaging your walls? That I don't know yet. I have not tried to remove it. I will say that when I had to remove small portions to reposition them most of the time, the wallpaper peeled off easily. However, I did have an instance where the top layer of paint stuck to the back of the wallpaper. I fixed this issue with a little bit of glue so there would not be an air bubble. After this problem arose, I was extremely careful and only peeled the wallpaper back from the wall when it was absolutely necessary. And in those instances, I peeled it very sloooooowly. So, what do you think? 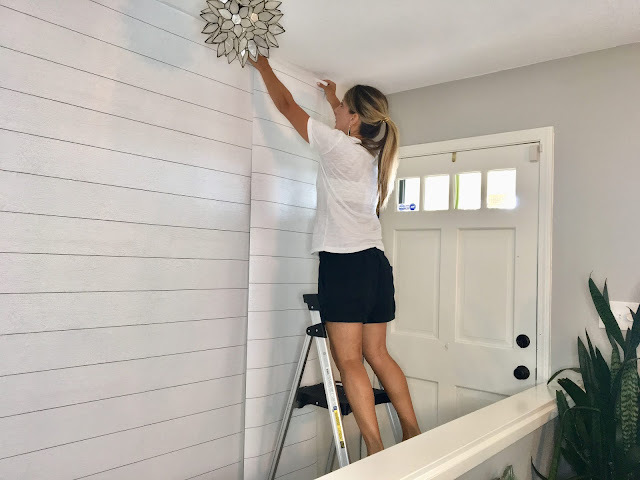 Have you ever tried removable wallpaper? I think it is so fun and can add a lot of character to any space! Nordstrom Anniversary Sale: What's the Hype?